Garnier Nutrisse Ultra Color Nourishing Hair Color Creme dramatically transforms naturally dark hair with ultra reflective tones. Choose from Ultra Light Blondes, Ultra Intense Reds and Burgundies, Ultra Lightening Browns, and Ultra Reflective Blacks. Ultra Light Blondes take dark brunettes to blonde without bleach, Ultra Intense Reds and Ultra Intense Burgundies offer vibrant red tones for darker hair, Ultra Lightening Browns lift dark hair up to three shades lighter without the brassiness, and Ultra Reflective Blacks transform even the darkest hair with visibly reflective, shiny tones. 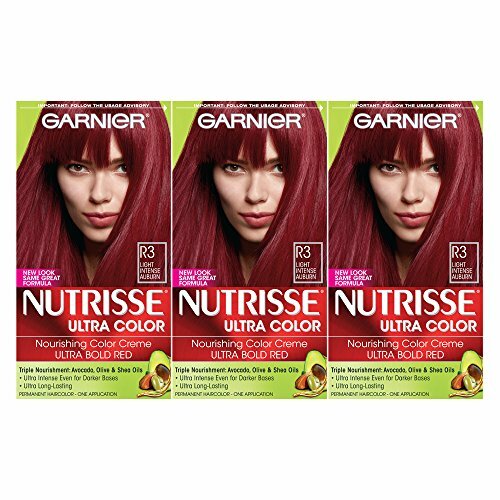 Garnier Nutrisse Ultra Color Nourishing Hair Color Creme comes with an ampoule of grapeseed oil to start nourishing hair while you color because nourished hair means better color. The non-drip hair color formula spreads easily and the after-color conditioner is infused with 3 fruit oils--avocado, olive and shea--for silkier, shinier, more nourished hair. Packaging may vary, what you receive may not be what is reflected on site. • Permanent, nourishing hair color creme with three fruit oils- avocado, olive, and shea • The only hair color creme with a separate ampoule of grape seed oil to start nourishing as you color • Intensity-enhancing color boost technology transforms even the darkest bases • Available in 21 bold shades Always read the hair color instructions insert in the box. Store between 50° and 80° F. Questions? Garnier Nutrisse has expert color consultants to help you. Call: 1-800-4GARNIER (1-800-442-7643). IMPORTANT: Hair color can cause an allergic reaction. Do not use if you’ve already had a reaction to a hair color product or if scalp is sensitive, itchy or damaged. Tattoos may increase risk of an allergic reaction. Do skin allergy test 48 hours before each use of this product. Don’t use over compound henna or progressive color. Wait at least 14 days after bleach, relaxing or perm before use. Don’t use on children. This is a safety summary. Read all labeling and instructions completely. If you have any questions about this product by Garnier, contact us by completing and submitting the form below. If you are looking for a specif part number, please include it with your message.